During the 1970s and ’80s several schemes and solutions were proposed, but it was the creation of the Central Manchester Development Corporation in 1988 which provided the catalyst for a viable solution in partnership with Manchester City Council. A former bus station and car park was identified as the site for the new building, close to G-Mex (now Manchester Central) exhibition centre and in 1989 a competition was held to choose the architects of Manchester’s proposed new landmark concert hall. The winners were Renton Howard Wood Levin (RHWL), renowned for their experience in the performing arts sector. 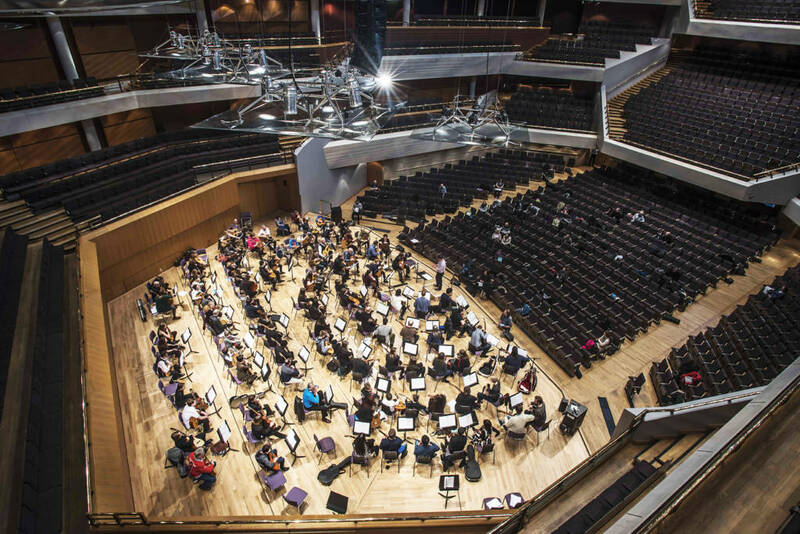 The design of the building was strongly informed by acoustic considerations and the input of Manchester’s musical organisations; a large part of the building’s success is due to the real creative collaboration between the architects and Arup Acoustics. After many revisions of the plans, the three and a half year construction project began in 1993. 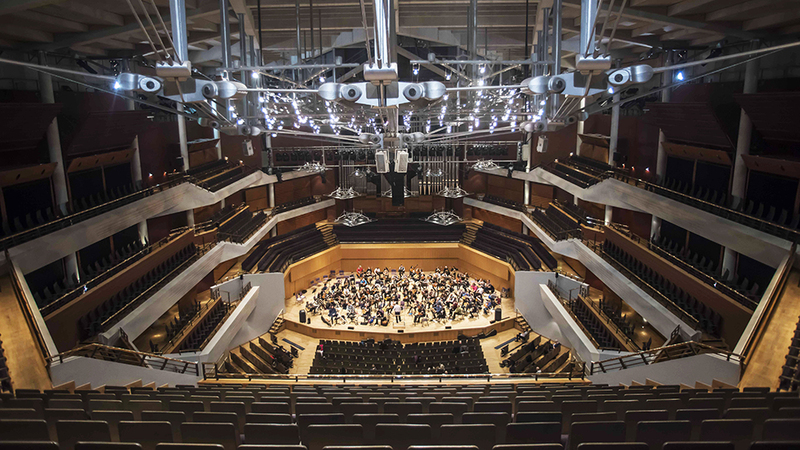 Unusually, The Bridgewater Hall is neither concrete nor steel-framed, but is mostly formed from solid, reinforced concrete, moulded and cast like a vast sculpture. This gives it the acoustic ideal of enormous density and mass. The remarkable roof appears to hover, weightless, above the building. One of the most fascinating aspects of the Hall’s construction is that the entire structure floats free of the ground on almost three hundred, earthquake-proof isolation bearings or giant springs, so there is no rigid connection between the 22,500 ton building and its foundations. 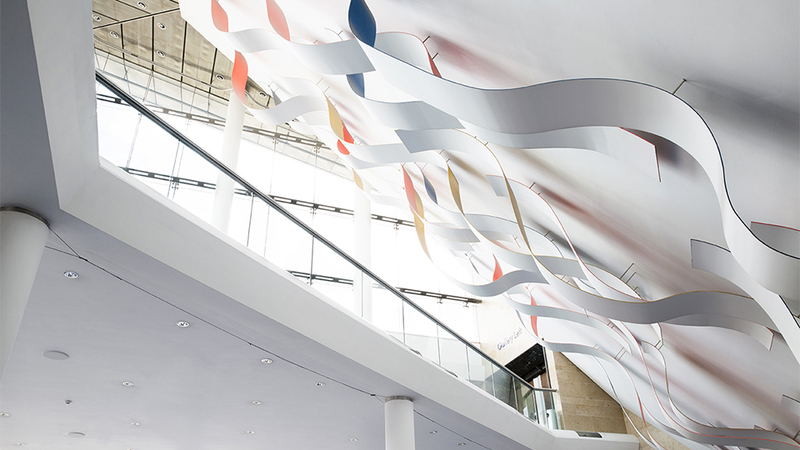 This ensures the Hall’s carefully designed acoustic is protected from all outside noise and vibration. 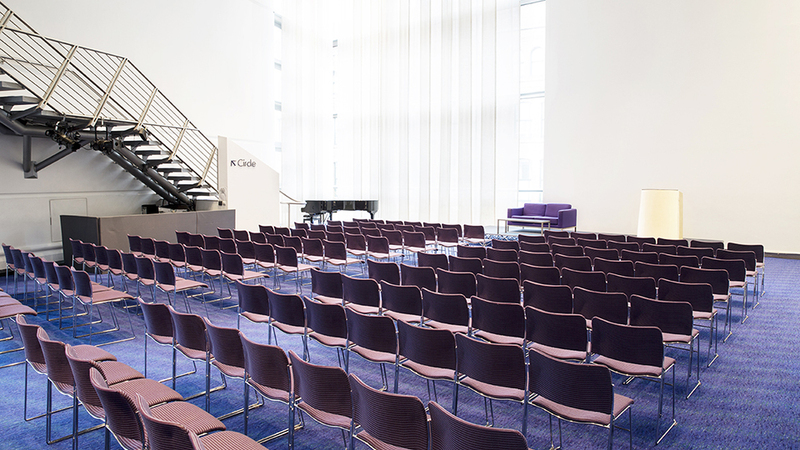 The Bridgewater Hall auditorium seats nearly 2400 people, but is surprisingly warm and intimate for a venue of its size. The seating is carefully tiered to draw everyone as closely as possible around and into the performance by uniquely combining two well-established designs, known as the ‘shoebox’ and the ‘vineyard’. Taking centre stage at the front of the auditorium is the Hall’s magnificent Marcussen organ. 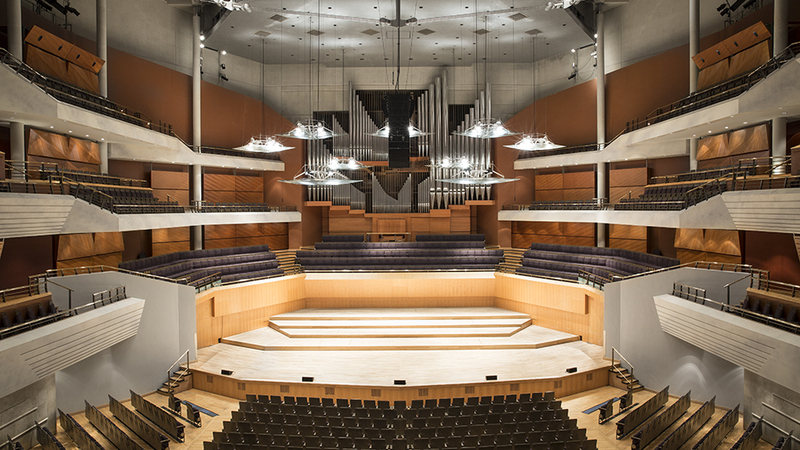 Above the auditorium’s concrete ceiling, a huge acoustic void houses technical systems and winches for lowering the chandeliers, lighting rigs and PA equipment. 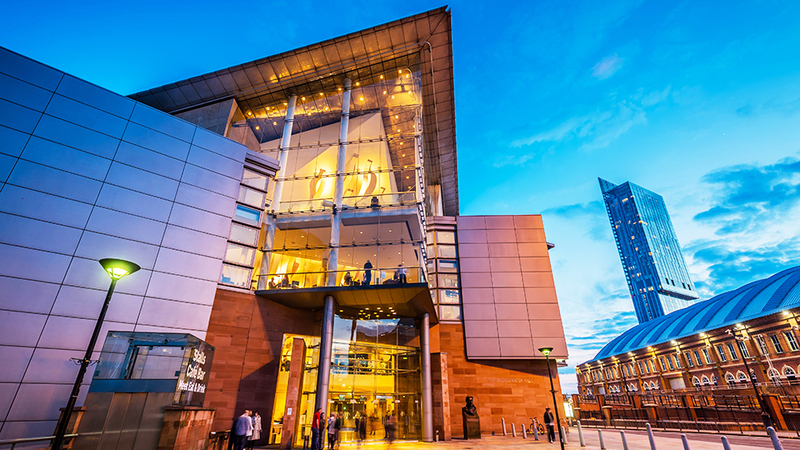 The Bridgewater Hall held its first concert on 11 September 1996 and was officially opened by Her Majesty The Queen, accompanied by His Royal Highness the Duke of Edinburgh, on 4 December that year. 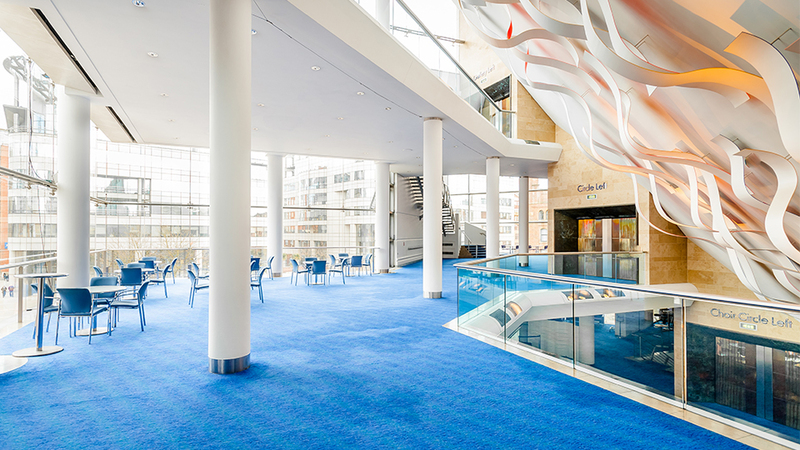 With the opening of this magnificent venue, Manchester’s civic and cultural history entered a dramatic new phase. For over 150 years, the city had an unrivalled tradition of fine civic building, of architectural and artistic patronage and of amateur and world-class professional music-making. 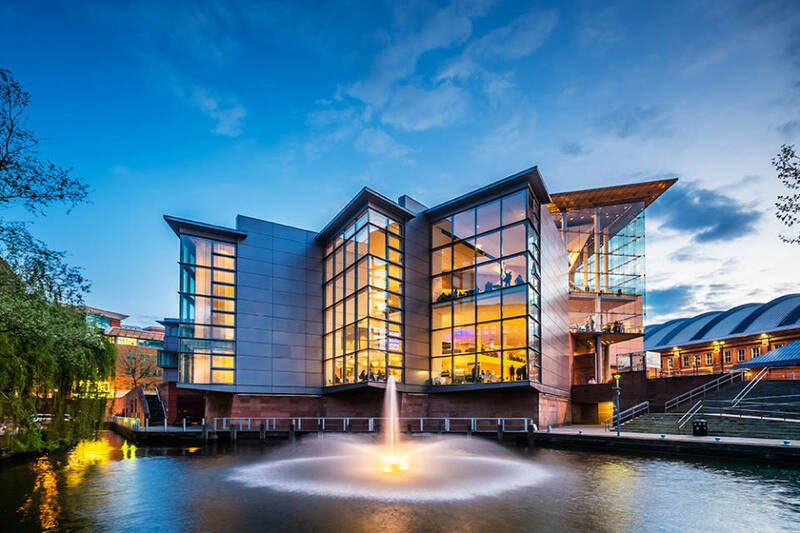 The Bridgewater Hall continues and consolidates these traditions, as well as being a prestigious flagship for Manchester’s overall regeneration and a symbol of its artistic health and enterprise. You can find out more about the history of the Hall and its architecture on a guided tour. 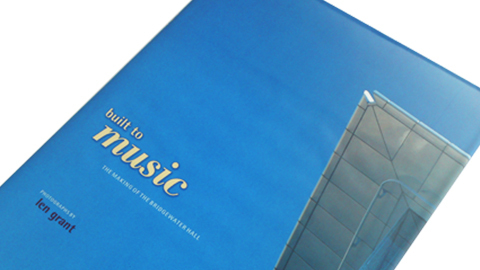 You can also purchase copies of the book Built to Music for £10.00 from The Bridgewater Hall Shop.